In 1961 Chew and Steve Frautschi put out another idea, related to this, which was that if you used the dispersion method for calculation there was a principle for the hadrons, for the strongly interacting particles alone, that would allow you to put in some sort of boundary condition, a boundary condition of going to zero at infinity, or something of that kind, that would then define a particular theory. And that particular theory would have the property that all the strongly interacting particles would be equally elementary or non-elementary. And this was the bootstrap. And the way I used to describe the bootstrap to people was that the… there was a certain list of hadrons, and these hadrons could be the particles being scattered, they could also be the particles being exchanged to give the forces, and they would also be the particles that resulted as bound states. And this self-consistency among all these different roles for the list of particles was basically the idea of the bootstrap, crudely speaking. Well that I liked very much. I didn't see why the dispersion theory method had to be distinct from field theory in order for this to be a good idea. And what I especially liked was this idea that the… all of the hadrons were equally elementary or not elementary: that seemed like a nice principle. Geoff called it nuclear democracy, I would rather call it hadronic egalitarianism, but it was the same thing. And it influenced me greatly later on in connection with the quarks two years later, because I changed it slightly to say that no observable hadron was more elementary than any other. Which is still true. Which is still true. In spite of having elementary objects. Yes. The elementary objects were not observable in the hadrons, but no observable hadron was any more elementary than any other. And I thought of that the same day that I thought of the quarks, on a visit to Columbia. And I've believed in it ever since. I think it's right. 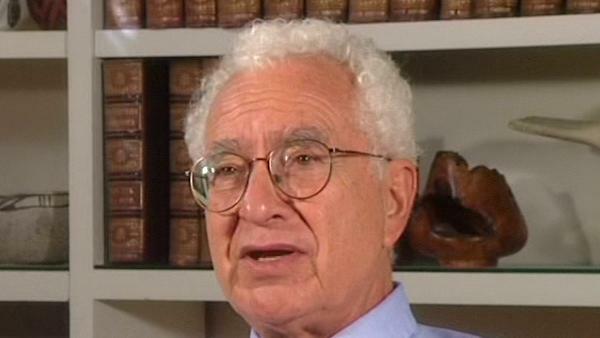 New York-born physicist Murray Gell-Mann is known for his creation of the eightfold way, an ordering system for subatomic particles, comparable to the periodic table. His discovery of the omega-minus particle filled a gap in the system, brought the theory wide acceptance and led to Gell-Mann's winning the Nobel Prize in Physics in 1969. Geoffrey West is a Staff Member, Fellow, and Program Manager for High Energy Physics at Los Alamos National Laboratory. He is also a member of The Santa Fe Institute. He is a native of England and was educated at Cambridge University (B.A. 1961). He received his Ph.D. from Stanford University in 1966 followed by post-doctoral appointments at Cornell and Harvard Universities. He returned to Stanford as a faculty member in 1970. He left to build and lead the Theoretical High Energy Physics Group at Los Alamos. He has numerous scientific publications including the editing of three books. His primary interest has been in fundamental questions in Physics, especially those concerning the elementary particles and their interactions. His long-term fascination in general scaling phenomena grew out of his work on scaling in quantum chromodynamics and the unification of all forces of nature. In 1996 this evolved into the highly productive collaboration with James Brown and Brian Enquist on the origin of allometric scaling laws in biology and the development of realistic quantitative models that analyse the influence of size on the structural and functional design of organisms.